From the Ashes is a new feature here at Somewhere Only We Know where I re-read books I read before I started blogging and finally review them. Goodreads description--Isabella Swan's move to Forks, a small, perpetually rainy town in Washington, could have been the most boring move she ever made. But once she meets the mysterious and alluring Edward Cullen, Isabella's life takes a thrilling and terrifying turn. Up until now, Edward has managed to keep his vampire identity a secret in the small community he lives in, but now nobody is safe, especially Isabella, the person Edward holds most dear. The lovers find themselves balanced precariously on the point of a knife-between desire and danger.Deeply romantic and extraordinarily suspenseful, Twilight captures the struggle between defying our instincts and satisfying our desires. This is a love story with bite. I wasn’t blogging back when I read Twilight for the first time. The story goes that my sister-in-law, who is now also a blogger @ Words Fueled by Love, took Twilight, New Moon, and Eclipse with her on a family beach trip—Breaking Dawn had not yet been released. When Holly spent all day on the beach our first day there reading Twilight, I knew there was something special about that book. Before that moment, I didn’t even know she liked to read. So I was curious about this book that could keep her so engrossed. After she finished Twilight on our first day there and moved on to New Moon, I asked her if I could borrow Twilight. She of course said yes, and my love of reading was officially re-sparked. I should note that when she first told me that Twilight was a “vampire book,” I completely wrinkled my nose and thought “why on Earth would I want to read a cheesy vampire book?” I had no idea that not only would Twilight re-spark my love for reading, but it would create a new love for paranormal young adult fiction. Because my love for reading was so recently rekindled and I didn’t have access to many books, I read and re-read this series. I believe 5 times in a row—a bit excessive, I know. But with the movie coming out less than 6 months after my first read through Twilight, I was enamored—though I wouldn’t say I was obsessed. With every re-read, I found more and more that I had missed. Each piece of the puzzle fit together perfectly. I was, of course, heartbroken when Midnight Sun was illegally released, and Stephenie Meyer said that she wasn’t sure she’d ever finish it. I even debated on not reading it at all in some sort of sign of solidarity. But eventually curiosity got the better of me and I checked it out. AND LOVED IT!!!! (I still have hope that she’ll finish it one day.) Getting a glimpse into Edward’s mind was great, and seeing things that happened behind the scenes that we’d never know about, such as how he and Carlisle handled the would-be-muggers from Port Angeles and Alice’s visions of him killing Bella versus him falling in love with her, and Edward’s involvement with Angela and Ben’s relationship was something that blew me away, as well as something I’d never experienced with any other series up to that point. I told everyone I knew about this series. And Twilight re-sparked or created a love for reading in so many of my friends that I didn’t even know would be interested. Some of my friends wanted so badly to read Twilight, but just couldn’t fit it into their schedules. So what did I do? I bought the audiobooks. That’s right. Despite already owning hardback copies of the entire series, I went out and bought the audiobooks too just so people I wanted to experience these books and didn’t have time, or didn’t want to read, could. My husband (yes I forced him to listen to these), my friends Kay, Arin, and Denise all listened to these on audio, and possibly even more. My sister too—though I think she read these books as first. All of that being said, with the recent release of the last movie in the series, Breaking Dawn Part 2, I’ve been feeling like it’s perhaps time for another re-read into a series that I loved so well. But with the ever increasing volume of books in my TBR list, I find it hard to find time for re-reading. And so thank goodness that I own those audiobooks. So…“What’s the point of all of this ranting?” you might ask. The point is that I’m doing a look back at a book that I love that I never got a chance to review after reading it for the first time. This time, I have the unique experience of being able to review a book that I’ve read many times. And I hope to try to do more of these type of reviews (though maybe not so lengthy) with some other books I’ve been really wanting to re-read that I never got to review since I read them before Somewhere Only We Know even existed. 1) It’s harder to pay attention to detail when you feel like you already know everything. When I already know what’s going to happen, sometimes I find myself skipping over details, but it’s the details that make stories so good—what makes the stories (not vampires) shine. Don’t skimp on the details. When re-reading, try to force yourself to focus on the details so you can pick up on things you’ve missed or forgotten. 2) I totally forgot how scary Edward was in the beginning. We all kind of fell in love with him and forgot that he’s totally ferocious and a predator by nature. I forgot how Midnight Sun, and even a brief mention in Twilight, shows how long he takes to truly decide whether he’s going to kill Bella or not. And let’s be honest, as much as well all love Robert P, he does play Edward as a bit of a softie. The first movie, though it will always have a soft spot in my heart, totally missed the danger of the scene in the biology classroom the first day Bella and Edward meet. And the “meadow” scene as well in the movie turned out to be quite cheesy and not very scary at all. And though it would have been difficult for the movie adaptions to capture the growl that the vampires do (and the times they tried to capture it, I didn’t buy it because it was obvious that the sound wasn’t coming from the actors), but the growl I hear in my head when reading the books is super scary. Truthfully because it’s left out of the movies so much, I kind of forgot they even did the growl thing. So…yeah….Edward is scary in the beginning. Let us not forget. 3) Another thing I forgot about Edward is his temper. Again Robert P. plays him as pretty laid back in the movies. But Edward of the book definitely had a temper. 4) I love how Edward doesn’t hesitate to laugh at Bella. She’s utterly absurd to him sometimes, but he loves her all the more for it. 5) I’ve always been impressed with how well and how often Stephenie Meyer wove Edward’s mind reading into these books, but it hits me hard going back through them because we don’t get to see it shown or focused so much in the movies. I also find myself questioning whether she explains everything with Edward and Alice’s abilities, and I was again satisfied to find that my questions were answered. 7) After having read as many young adult novels as I have over the last 5 or so years, I can really appreciate the 20 Questions style that Stephenie Meyer took for Edward and Bella to get to know each other. So many books I’ve read and wonder why the characters even like each other past physical attraction because they don’t seem to know each other at all. The exchange between Edward and Bella shows a desire to know each other past their initial attractions and it continues to build from there. 8) And my final point (I think) from this re-read is that I was more aware of how unhealthy Bella and Edward’s relationship is at this point in the series. Obviously, the panic she feels in the hospital room at his even mentioning the idea of leaving throws her into utter panic. Of course, I understand being there. Wanting nothing more than to be with the one you love, but I’ve also come to learn how unhealthy that is and how you have to have things in your life to live for more than one singular person. And we all know that I get to experience this in a much greater level of detail and length once I move on to New Moon. My initial reaction after my first read through of Twilight would have probably been 5 Stars. But since I never reviewed it, I feel like 4 Stars is the best rating I can give it. I still love the series and Twilight as an individual book. It will always hold a super special place in my heart. 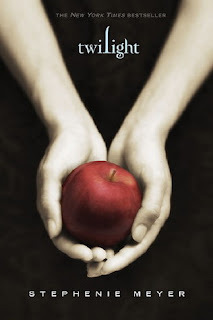 And I feel like I owe a special thanks to this book, this series, and to Stephenie Meyer. I hesitate to even ask what you thought of Twilight since there are so many different opinions out there now, and truthfully I don't care to see any hating....but here goes. What did you think of Twilight? Have you given it a re-read? Let me know! Thanks Holly! Russ created the button for me, but he said he still wants to tweak it some. Love your new feature and button to go with it!!! Great job!